After the initial rush of optimism at the beginning of the Civil War, it became clear that soldiers would be needed for longer than 90 days. The term of service became three years and, when facing death every day, three years was a mighty long time. 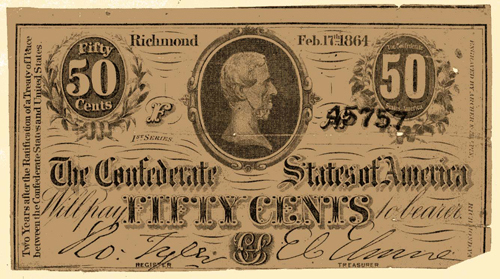 This Confederate money is from the scrapbook of Henry Campbell [W1871], a prep student here in the early 1860’s. His father, John Paxton Campbell, was a trustee of Wabash College for 18 years. The Campbell’s were a local merchant family and John was well known in town for his musical abilities. He played the trumpet with a group of young men who provided the music for many local festivities. It was during the physical that Henry’s youth was flagged as a limiting factor. He would have to go home while his friends went to war. In Campbell’s own words, “Battery organized and drilling. – Appointed 2d Bugler – a fellow named Anderson 1st. – Crawfordsville boys all tent together – 18 in one tent, weather hot, – Medical examination Aug 6 – all passed but myself – refused on account of my age, – too young. Thought I was gone sure – but Captain Lilly told the Dr. that I was intended for his bugler and that it was ‘essential to the interests of the service’ &c – that I should be retained – which was finally done.” A bugler was a non-combat position and that eliminated the age barrier. Campbell was in. As did so many men, Henry decided that he would keep a diary of his experiences and was faithful in his entries. He titled the results Three Years in the Saddle. The reader follows this boy as he learns about life in the army and death on the battlefield. As a part of an artillery unit serving in the hills and mountains of east Tennessee, Campbell and his fellow soldiers struggle to haul the cannons up hills and down. The deprivations of an army on the march leave him oftentimes hungry and frequently cold. The reader learns a lot about these men in the 18th Indiana Artillery. The men included Captain Eli Lilly. We now know that Lilly returned from the Civil War and started a pharmaceutical company which is one of the largest in the world. We learn that Lilly was a man of clear vision and high principles who took young Campbell under his wing. This artillery company becomes a part of Wilder’s Lightning Brigade, among the first units to mount their infantry and arm them with repeating rifles. The accounts of the first battles where the repeaters were used is just incredible. The battle maps that Campbell drew are also amazing. great details, especially clear because the context is clear, too many blog post stray off topic and lose my interest, good job on bring the details out.